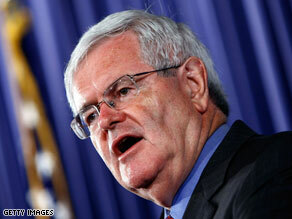 Newt Gingrich endorsed Hoffman via Twitter Saturday. WASHINGTON (CNN)– Former House Speaker Newt Gingrich, who came under fire from some conservatives for endorsing Dede Scozzafava in next week's special Congressional election in New York, is now backing Conservative Party candidate Doug Hoffman. Polling showed that Scozzafava was running third in this special election for what had been a traditionally safe Republican seat. But a split among Republicans over who to support, Scozzafava or the more conservative Hoffman, opened the door for Democratic nominee Bill Owens to capture the seat. National Republican Party officials, who had also endorsed Scozzafava, are now lining up behind Hoffman. This new show of GOP unity will make it more difficult for Owens to win the election on Tuesday. Once again..........Can you say......KISS OF DEATH?? And exactly what did the tax policy Gingrich advocates give us? People need to wake up to the fact that's been staring them in the face for the last 30 years: When Republicans talk about "tax cuts," they're talking about cutting taxes on the wealthy – ONLY – who then take that money and invest it overseas, building factories there and shutting them down here. All these irresponsible tax cuts for the wealthy are what took the Clinton surplus and turned it into the massive Bush deficit. You really want more of that? Only a fool would vote for Hoffman! One thing about these pubs... it doesn't take much for them to "get in line." What a gutless, thoughtless crew! No other way to describe this but a win for the extreme right-wing faction of the Republican Party. Religious-right crusader Sarah Palin backed extremist Doug Hoffman, and then GOP Pawlenty was forced to follow Palin's endorsement of Hoffman. Initially Newt Gingrich and GOP Party Chairman Michael Steele backed Republican Moderate Dede Scozzafava, but now that she has dropped out due to pressure from Palin and the extremist, Steele and Gingrich are left holding the "Moderate" bag. It is time for all politicans to realize that America is not happy with politics as usual, that means Repubs and Dems. It really does not matter who endorses a candidate. Whether it be the Rep National Party or the Dem National Party or Obama Or Gingrich. People want representation and not more talk of change. Nice display of republican principles. Now the Republican Party is starting to listen...and not to the knuckleheads of the MSM like Katie Couric....yeesh. Dede saved your hide this time Newt, don't make the same mistake twice. Dede...'Thank You' for doing what is best for the party and the country. The GOP is a train wreck without a conductor. Can you believe that that what is left of the real republican party is sinking to a new low. Even the Taliban supports Hoffman. AND that doesn't bother republicans. You just shake your head and say how, how in the world can republicans become so dumbed down and violent. is this supposed to be a good thing? Too late Newt. You've successfully tied yourself to the lefty RINO. Carnell From The Motor City! Interesting That Newt "The Grinch" Gingrich Crawls From Out Under His Rock Just To Endose....Weeeee! ...Yea! Newt is another one who will acquiesce when it comes to the Conservative Republican Party. Just because Scozzafava dropped out of the race doesn’t mandate him supporting Hoffman. If Newt didn’t think Hoffman wasn’t worth supporting in the first place, then maintain some credibility and just don’t support anyone. If you believe in individual freedom and choices you better be prepared to get out and support your Democratic candidate. Finally – the moderate Republicans "see the light" and endorse Hoffman. Hope it isn't too late! We need the conservative viewpoint in Congress! Dede made a HUGE mistake in a recent commercial coming out of the closet as a liberal ..touting her support of O Bama's stimulus, of gay nuptuals and pro abortion stands..It was comfirming what Hoffman had said was TRUE..She was DONE after that ..Her poll#s dropped from the 30% to 20% in a week. Wow, Newt. Really going out on a limb there. THe R pulls out, so now you'll endorse the conservative? Why don't you go back to something you do well, like infidelity. Let's just remember Newt as the philanderer who persecuted Clinton for having an affair. I was against him before I was for him,but now its time I am against him,wait a minute for him.Outsiders should just stay out of this,opps I am an outsider as well.Well Palin was before a bridge before she was against it.However at least she got this one right by being just for him.Seems she is learning she can compete with these GOP cowards.Ya they are cowards who only endorsed after their women stood up and said no to this acorn approved lib.Only one male Fred Thompson supported him when the chips were down as well as his poll #s.This says everything about the GOP so called male leaders. 99% of them are losers,wafflers,and cowards.Heres the latest example today this guy and Huckabee join up.Cowards pathetic cowards, who gave lame excusses to waffle or support the liberal. That add was put up by Hoffman's Club for Growth supporters. Dede is the only one of the three who really has a handle on the issues important to the North Country and because of that should have and would have attracted a fair number of moderate Democrats. Unfortunately, the National Republican are no longer interested in a big tent or any candidate who strays from a strange brew of conservative ideology that seems to come from the Hoover era. Gingrich and Steele must obey the party rules and do what they are told. Sasd, but true, but if the freakin democrats would stick together then we could have health reform. Wake up America! Think about life and liberty under the extreme right wing–it's very scary.